Simtec have directly sponsored the work for the ARM Linux community to ensure that the core support for the S3C2410 range of Samsung SOC is fully integrated into the mainline kernel. Simtec continue to support kernel development of all Samsung S3c24XX parts and numerous machines including the EB2410ITX. Some peripherals are not yet fully supported in the mainline kernel, until the support for these peripherals is merged an additional patch will be provided. The peripheral patch should be applied with patch -p1, for more details on building ARM kernels Russell King maintains a Kernel Compilation document. Simtec maintain a separate ARM Linux community site which provides a wide range of resources not specifically limited to our products. Simtec have a policy of continuous updates for our Linux kernel patches and we recommend using the latest version for any new project. Older versions of the peripheral support patch are available, patches for the previous kernel versions have omissions in driver support and reliability issues not found in the most recent versions. The legacy 2.4 kernel port is functional but less well developed than the 2.6 kernels, it is provided here purely for historical interest and is no longer actively developed. Because ARM support was not fully merged into 2.4 mainline kernel sources a large architecture patch is required in addition to the board patches. patch-2.4.26-vrs1 Arm Linux architecture patch. the resulting kernel will have the build identifier of 2.4.26-vrs1-bast3. Simtec continue to provide the Debian project with equipment and developer resources to ensure the ARM port of this Operating System is well maintained. The current 4.0 Release of Debian supports most simtec products, it is recommended the Simtec Linux 2.6 kernel is used as this gives more reliable operation. It is increasingly popular amongst our customers to use a bootstrap method to install the Debian system and to address this we have provided a complete guide. Instalation of older releases is possible, however these used the Linux 2.4 kernel and support for this kernel version has been depricated, hence the resources provided here are typically only of historical interest. The 3.0 (woody) release is only installable from an early version of the support CD and is not available online. The 3.1 (sarge) release contains complete support for this board (codename bast). Unfortunately due to a compile issue the official Debain install media contain a kernel which will not boot on this platform. A updated kernel and debian installer image for all Simtec platforms has been provided. A patch to add support for the integrated LCD Module port on the EB2410ITX to the popular open source LCDproc project. This patch applies to version 0.4.4 of the LCD Proc sources a more detailed description is available. We have successfully tested the Abatron BDI1000 JTAG programmer on this board. We provide a configuration file and some notes on its use. Introduction - A general introduction to the Samsung 2410 Evaluation Board. Specification - A list of all the Samsung 2410 Evaluation Board specifications. Firmware - Firmware for the Samsung 2410 Evaluation Board. FAQ - Frequenty Asked Questions about the Samsung 2410 Evaluation Board. 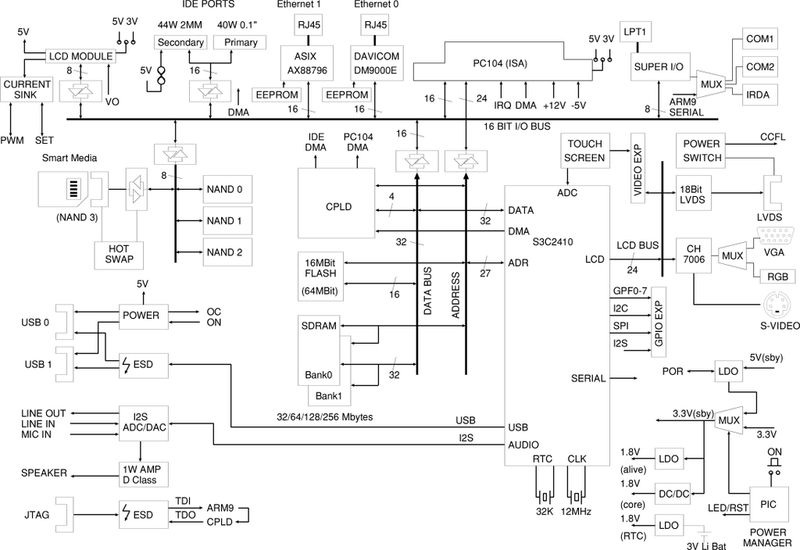 Application Notes - Application notes suitable for use with the Samsung 2410 Evaluation Board. Gallery - Images of the Samsung 2410 Evaluation Board.